My speech went over time. They hated me! I panicked when I was told to add 20 minutes to my talk! • How do you calculate correctly how long your talk will take? Many people misjudge their timing, and either go over their allotted time or run out of things to say. • How do you quickly adjust the length of your talk? What do you do if you are told, shortly before you are to begin, that you have either more or less time than you had anticipated? 1. Prepare properly. If you have prepared what you want to say, you are less likely to ramble, which adds additional time to your talk, and less likely to forget material, which would shorten your presentation. 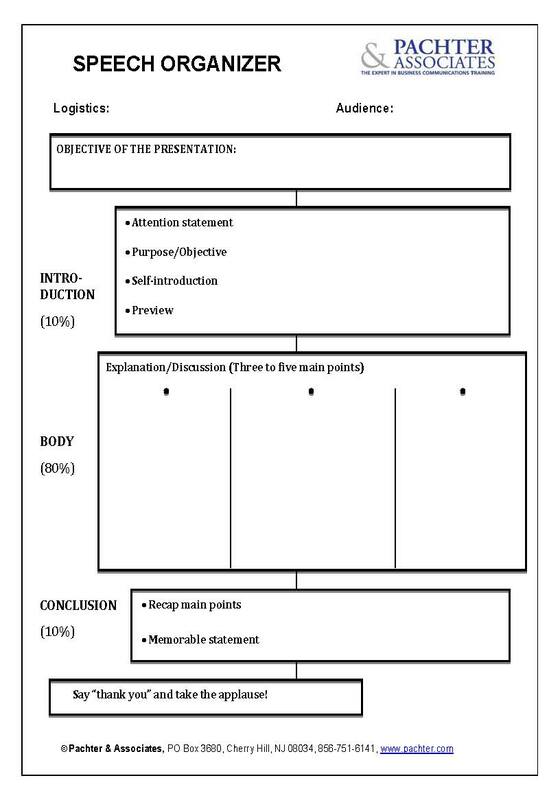 In my training classes, the participants use my Speech Organizer, which provides a visual representation of the parts of a speech, to structure their presentations and plan what they want to say. 2. Time yourself. Practice giving your presentation so you will know how much time your talk will take. This needs to be done a couple of times so you become comfortable with your material and your pacing. Timing your talk won’t be helpful if you are racing through it or stumbling over sections. 3. Know what to add or delete. Part of your preparation is anticipating time concerns, and knowing what material you can easily add or eliminate from your talk. To add extra material, have at the ready additional research, statistics or stories that highlight your key points. The opposite approach is effective when you need to shorten your remarks. Know ahead of time what material is not crucial for your key points, and don't discuss those items. Speaking faster is not a substitute for the elimination of material. 4. Get a signal. Have someone in your audience give you an unobtrusive signal to designate when you have only a certain amount of time left. More tips can be found in my new book, The Essentials of Business Etiquette: How to Greet, Eat and Tweet Your Way to Success (McGraw Hill). Love this! I have been coaching and training for years - the last 12 in the real estate industry, and the bulk of that was in New Jersey! Wish I had connected with you while I was there. You're so right about this critical skill with which so many speakers struggle. When I coach my clients in the area of timing, the first question I ask is: How much time have you been allotted? Too often they're unsure; this is the first mistake that is easily remedied. With this knowledge in hand, they're well-prepared to design their message. Timing can make or break one's success as a speaker! Thank you...this is an excellent point. You're right Barbara. It happened to me as well. Next week I'll be having a week long teacher training with 330 participants.Your insight is truly helpful for me not to commit the same mistake.